I would really challenge you to find someone who doesn’t enjoy a glass of lemonade. I don’t know if this person exists. It’s like hating sunshine or hugs. Honey and lemon are some of natures best ingredients; honey is soothing on the throat (for those of you with allergies) and quite healing. The invigorating citrus properties of lemons boost mood and pack a serious punch of vitamin C. And, oh, the treasure that is rhubarb! Did you know that it’s actually a vegetable? Rhubarb is bursting with antioxidants, fiber and calcium. Sparkling Honey Rhubarb Lemonade is the ultimate summer elixir. P.S. The Honey Rhubarb compote is also amazing with plain Greek yogurt. Add an extra dollop of honey if you need to adjust sweetness. Bring honey and Port to a boil in a small sauce pan. Mix in rhubarb, coating with honey Port syrup, bring to a boil then simmer for 20-30 minutes. You are looking for a thick jam-like consistency. Cool and store in a glass jar in the refrigerator. I used an organic store bought lemonade that wasn’t super sweet. Of course you can make your own, but there are such great options out there – skip a step and get to the fun part, drinking. Divide ice into two glasses. 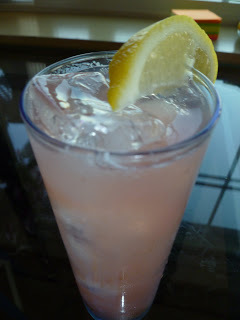 In a pitcher, mix together lemonade, lemon juice and rhubarb compote; pour over ice, finish with club soda and garnish with lemon wedge. Take it up a notch by adding a shot (or two) of good vodka. I like to call this cocktail “Where’s My Shoes” …as in the next morning. It could also be called “Where’s My Phone” “Where’s My Keys” “Where’s My Purse” and if you had a really good night, “Where’re My Clothes”. ← Smoked Trout – Discovery of the week!